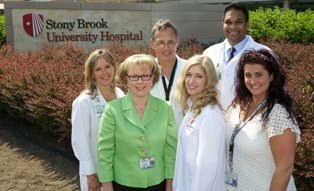 Members of the Lung Cancer Evaluation Center (LCEC) team at Stony Brook University Cancer Center are, left to right, front row: Maureen Farrell, Sunday Campolo-Athans, NP, and Denise Vidal; and back row: April Plank, DNP, Thomas Bilfinger, MD, ScD, Co-Director, and Sajive Aleyas, MD, Co-Director. 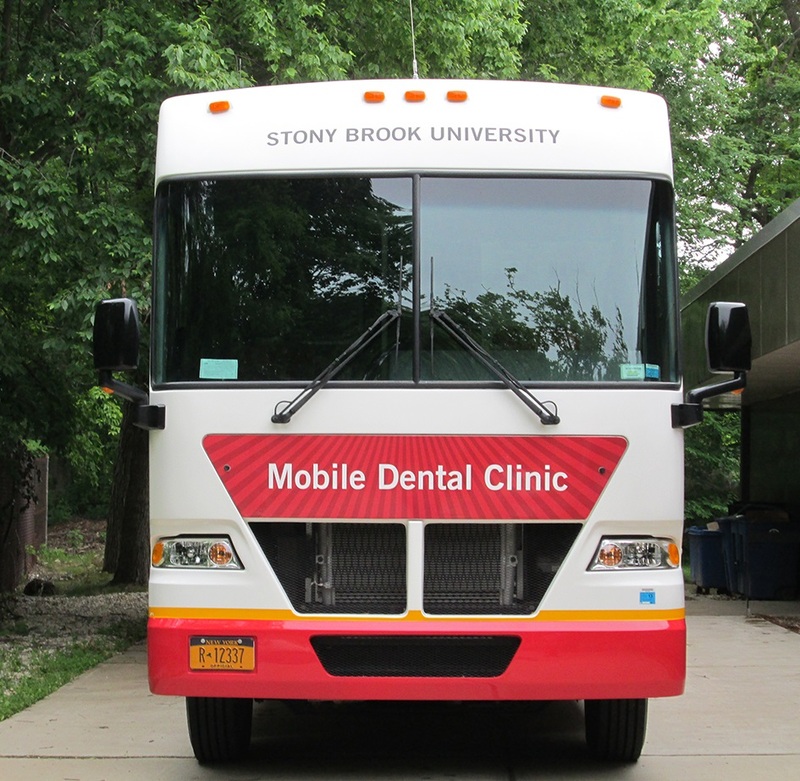 STONY BROOK, NY, September 23, 2013 – The Lung Cancer Evaluation Center (LCEC) at Stony Brook University Cancer Center is starting a new lung cancer screening program on Sept. 30, consistent with recent recommendations announced by the US Preventive Services Task Force. The screening program includes a low-dose radiation Chest CT scan for high-risk patients with the goal of early detection. Since its inception in 2001, the LCEC has evaluated more than 5,000 patients with chest abnormalities. 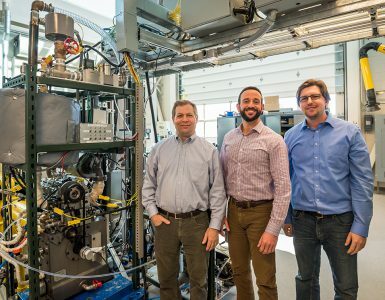 Up until now, the diagnosis of lung cancer has been made when patients have symptoms or through incidental findings on chest x-rays or CAT scans done for other reasons, said Sajive Aleyas, MD, an Interventional Pulmonologist, who serves as Co-Director of the Lung Cancer Evaluation Center. The proposed federal guidelines recommend annual CT screening of current and former smokers, ages 55-80 with a history of smoking equivalent to a pack-a-day for 30 years or two packs a day for 15 years. The recommendation applies to those who have quit smoking in the past 15 years. Other candidates for screening include people ages 50-80 that have smoked a pack a day for 20 years and have one additional risk factor, such as radon exposure, occupational exposure, lung disease, history of cancer or family history of lung cancer. The US Preventive Services Task Force believes the benefits to these smokers outweigh the risks involved in receiving the annual scans. About 22,000 of the United States’ nearly 160,000 annual lung cancer deaths could be prevented if doctors follow these screening guidelines, the Task Force said. Lung cancer found in its earliest stage is 80 percent curable, usually by surgical removal of the tumor. 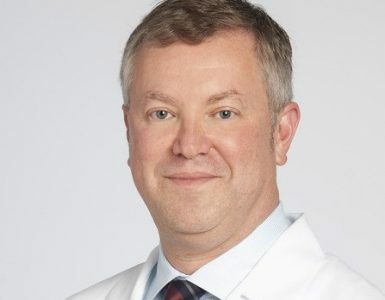 “Our service has the infrastructure in place to ensure appropriate screening and follow up,” said Thomas Bilfinger, MD, Thoracic Surgeon, who serves as Team Leader and Co-Director of the Lung Cancer Evaluation Center. The process involved will begin with initial telephone screening. Patients who are deemed appropriate for lung cancer screening will then undergo a comprehensive evaluation, which will include CT scan, review of the CT findings, explanation of the radiation exposure risk and smoking cessation counseling. Lung cancer is the third most common cancer and the leading cause of cancer death in the United States. It claims the lives of more patients than breast, colon, prostate, and ovarian cancers combined. The most important risk factor for lung cancer is smoking, which results in approximately 80 percent of all lung cancer cases in the United States. Although the prevalence of smoking has declined, approximately 37 percent of U.S. adults are current or former smokers. The incidence of lung cancer increases with age, occurring most commonly in people ages 55 years or older. Increasing age and cumulative exposure to tobacco smoke are the two factors most strongly associated with the occurrence of lung cancer. Lung cancer has a poor prognosis, and nearly 90 percent of persons with lung cancer die of the disease. However, early-stage non-small cell lung cancer (NSCLC) has a better prognosis and can be treated with surgical resection. 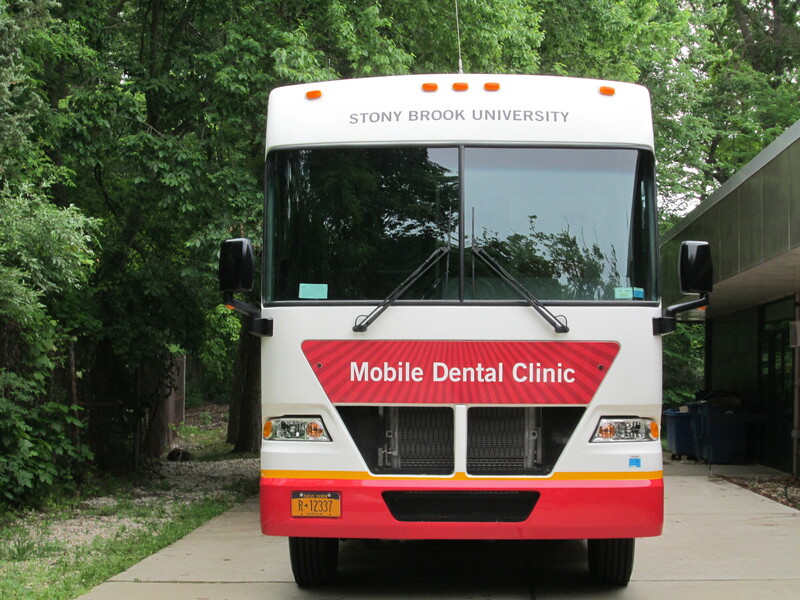 Stony Brook University Cancer Center is Suffolk County’s cancer care leader and a leader in education and research. With more than 20,000 inpatient and outpatient visits annually, the Cancer Center includes 12 multidisciplinary teams: Breast Cancer; Colorectal Cancer; Gynecologic Oncology; Head, Neck and Thyroid Oncology; Lung Cancer; Melanoma; Neurologic Oncology; Orthopedic Oncology and Sarcoma; Pediatric Hematology/Oncology; Stem Cell Transplantation and Hematologic Malignancy; Upper Gastrointestinal Oncology; and Urologic Oncology. The cancer program is accredited by the American College of Surgeons Commission on Cancer as a Teaching Hospital Cancer Program and received the Commission’s Outstanding Achievement Award. The Carol M. Baldwin Breast Care Center is the first center in New York State to be accredited by the National Accreditation Program for Breast Centers. To learn more, visit www.cancer.stonybrookmedicine.edu. Created in 1984, the U.S. Preventive Services Task Force is an independent group of national experts in prevention and evidence-based medicine that works to improve the health of all Americans by making evidence-based recommendations about clinical preventive services such as screenings, counseling services, or preventive medications. The task force reports to the U.S. Congress every year, and its recommendations often serve as a basis for federal healthcare policy. Insurance companies often follow its recommendations as well. To learn more, visit www.uspreventiveservicestaskforce.org.